The outboard motor has become one of the most common forms of marine engine out there. Yet it is often loud and annoying. At full throttle, the scream of your motor makes conversation all but impossible. That is why Noise Reduction Enterprises developed the Outboarder Kit. 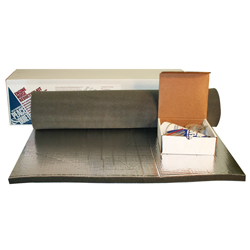 It provides adequate soundproofing at an affordable price. The kit comes with fully illustrated instructions and is great for a short weekend project. Airborne engine noise can be low, moderate, high or severe, depending upon the type & size of the engine, whether it is gas or diesel, and its mounting method. Low to moderate noise levels might be a slight annoyance, while severe noise levels are painful and can cause permanent hearing damage. This brief explanation of Soundproofing and its application is not intended to address the complex technical aspects or the wide variety of material combinations employed to reduce every conceivable noise pollution situation, but rather to present you with a simplified selection of basic materials which have been proven to satisfy the needs of the majority of boating applications. Marine noise pollution can be reduced in one of two practical ways. The most obvious would be to get as far away as possible from the noise source - a difficult task within the confines of most vessels. The other method is to effectively apply soundproofing to isolate and absorb bothersome noises. Soundproofing materials can be very effective for airborne noise pollution when properly selected and applied. Obviously, because of space restrictions, mounting configurations, and other considerations, it is not always possible to use the best material for the job and some compromises must be made - As a practical matter, the noise problems are seldom totally eliminated, rather, they are more often reduced to acceptable levels. These materials may not be effective for poorly isolated engines capable of transmitting vibration directly to the hull or super structure of your vessel. These highly efficient materials offer the latest in advanced materials technology - used alone or together in any combination, they will satisfy the majority of noise reduction requirements. These quality materials are LEAD-FREE and easy to work with. They meet or exceed Underwriters Laboratories UL-94HF-1 Self Extinguishing flammability requirements. This information is offered to you as a general guide, based upon many years of practical experienced. We make no representations that these solutions will work for your specific application - The Buyer assumes full responsibility for determining the suitability of goods for his application. Soundproofing can be accomplished in stages, depending upon the noise level reduction that you wish to achieve. A "complete" sound proofing job requires total encapsulation of the noise source. Obviously, this is not practical in most applications, and could cause engine suffocation and overheating. Noise Reduction Enterprises suggests you first consider those, areas such as hatch covers, engine boxes, bulkheads, etc., which are most obvious and easily accomplished - then if more noise reduction is required, continue with the remaining surfaces, such as decks, bulkheads, hull surfaces, etc., until an acceptable level has been reached. Remember to always allow for engine cooling and air intake. To permit future accessibility, always install soundproofing behind piping, wiring, pumps, etc. (remove & reinstall if necessary). Soundproofing may also be applied to the exposed side (side facing engine) or below deck fuel tanks. Where possible, particularly in overhead areas, we strongly recommend using mechanical fasteners, batts, or some other means of mechanically attaching the material to prevent it from falling onto Hot Exhaust systems or the engine itself. REMEMBER THIS MATERIAL IS FIRE RETARDANT AND NOT FIRE PROOF - IT WILL BURN. The noise you are trying to eliminate is being generated by a mechanical device that also transmits vibration to all mounting surfaces. Over time, the vibration could loosen and detach the soundproofing. The type of material selected generally depends upon the frequency range and intensity of noise pollution. Quiet-Foam (1/2" and 1") is best employed to absorb the higher frequencies usually generated by gasoline engines. SuperQuiet Foam (1/2" and 1") is a composite material that offers both sound absorption and sound barrier properties, and is recommended for the low to mid-frequency noises normally associated with diesel engines. If your noise problem is severe, you can double-up, or mix and match the materials for increased effectiveness.